Vinyl sheet protectors provide maximum durability plus outstanding performance. The feel of these vinyl holders shouts quality! Vinyl sheet protectors provide maximum durability plus outstanding performance in preserving and protecting high-use presentation materials, letters and reports. Constructed from durable and tough vinyl material. 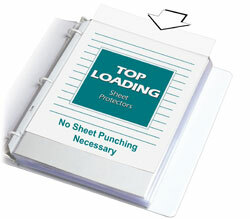 Clean hole punching now makes these easier to load into three-ring binders. Unique shaped corners allow for quick and easy page turning. Clear finish. 50/BX. Sheet Protector Special Features: Vinyl top loading sheet protector fits 11 x 8 1/2 sheets into standard size three-ring binders. Suggested Use: Vinyl material makes the holder very durable and resistant, which works well when handling high-use documents.